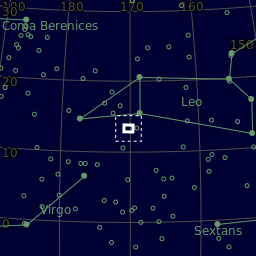 The Leo triplet or M66 group is located in the constellation Leo at approximately 35 million light years and contains M66, M65 and NGC 3628. NGC 3628 (Hamburger galaxy) has a 300000 light year long tidal tail that is visible in this image taken mostly at SQM 21.7. The vertically-oriented feature visible at the very end of the tidal tail is a tidal dwarf galaxy (TDG) that was discovered by Nikiel-Wrocynski et al. only last year (2014). The idea of dwarf objects forming from the tidal debris left by galaxy mergers was first proposed by Zwicky in 1956, with many such ‘recycled’ galaxy candidates now known in various merging galaxy systems, with this one the closest to the Milky Way.